There are multiple ways for you to give at Buddhanusorn temple. Online giving is a safe and easy way to support us. This system enables you to support the Buddhanusorn temple by making a one-time contribution or establishing a recurring contribution through your debit/credit cards or bank accounts. All online transactions are handled securely through PayPal and offer a nice alternative to traditional physical money transactions while providing a receipt for your tax purposes. If you have any questions or concerns about anything on this page please don’t hesitate to contact us. Monthly pledges go a long way toward reaching our goals and offer some very welcome stability to our finances. Below you will find varying amounts to pledge each month. Choose a value you can feel comfortable with. Many blessings to everyone who commits to a monthly pledge. 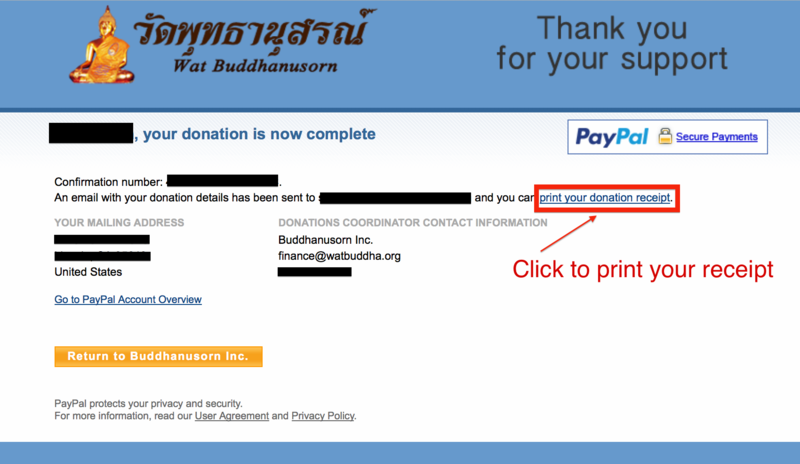 EIN#: 94-2925014 | Official Organization Name: Buddhanusorn Inc.
Up to 3% of what you give will go as fees to PayPal or credit card companies. If you would like to cancel or make a change, simply click here to be taken to your PayPal account where you can submit your cancellation request. Please email donate@watbuddha.org to request a refund. Wat Buddhanusorn gratefully receives your donation, and respects the purpose you specify for its use. Please note, however, that all donations are received as unrestricted general funds of Wat Buddhanusorn. Thus they may be used for other temple purposes, if determined necessary in the circumstances by the Wat’s Board of Directors. Please be aware, while we accept credit cards for donations, we still strongly encourage the use of electronic funds transfer rather than credit card for two good reasons: Although many pay off their credit card balances each month, many also do not. We do not want to encourage someone to go into debt and pay interest on gifts given to the temple. We offer the opportunity to donate by credit card as a convenience to those who manage their finances in a good way. With electronic transfer (your bank online “Bill Pay”), your entire gift amount goes to the temple. When using a credit card through PayPal, as much as 3% of your gift can go to the PayPal or the credit card company. PayPal completes the process for you, without sharing your financial details with merchants and sellers. Learn more about PayPal here. Do I need a PayPal account to make a donation? No, you don’t need to have a PayPal account in order to donate. How to donate without having a PayPal account? Not everyone has a Paypal account, but you still can do a donation with PayPal without having a PayPal account. Just follow the steps below. Click on the PayPal “Donate” button. Enter the amount you wish to donate into the box on the top of the screen. Click on the “Review Donation and Continue” button on the bottom of the screen to confirm and complete your transaction. Buddhanusorn is a federally recognized 501(c)(3) public charity; therefore, your contribution may be tax-deductible. Please check with your tax adviser to find out more. What is Buddhanusorn 's Employer Identification Number (EIN), also known as a Federal Tax Identification Number? Why does my credit card statement read, 'PayPal*BUDDHANUSOR' when I make an online donation to Buddhanusorn? 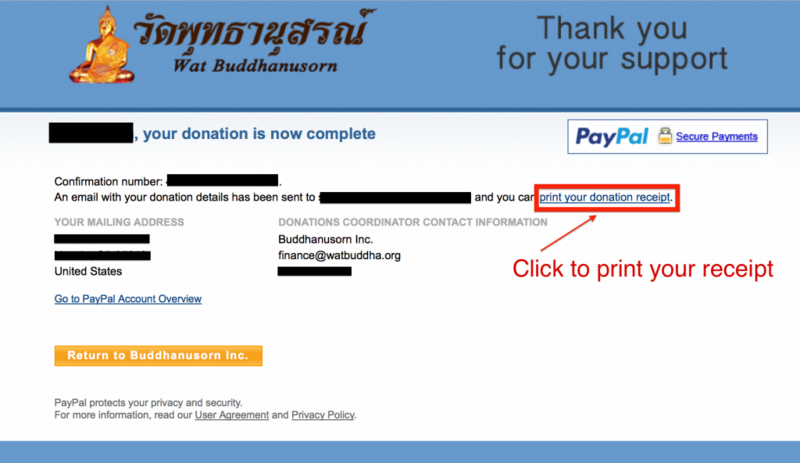 Is it safe and secure for me to donate online to Buddhanusorn temple? Additionally, your personal information will be stored on PayPal’s servers, which are heavily guarded, both physically and electronically. To further shield your credit card numbers, PayPal does not directly connect its firewall-protected servers to the internet. Please direct any questions you may have about donation to our Treasurer at (510) 468-2546 or email to donate@watbuddha.org. Yes, on our donation page, click the Monthly Pledge tab. You can schedule a monthly donation to Buddhanusorn temple. We will receive your Monthly Pledge amount of your choice automatically each month for one year. If you wish to continue your contribution, you will need to resubmit it at the end of your 12-month term. How do I cancel my recurring monthly pledge? Two ways to cancel your recurring monthly pledge; 1. If you have a PayPal account, simply follow the steps below. Click Update in the My pre-approved payments section. My company match my gift to 501(c)(3) organizations. Is Buddhanusorn temple eligible to receive this type of match? Yes, the IRS recognizes Buddhanusorn as a public charity under section 501(c)(3) of the tax code. Thanks for asking! How do I get a receipt of my donation? Click Find a transaction, and search for a transaction. Select “Details” next to any of the transactions that appear. Is there any charge or fee do I have to pay to donate via PayPal? No, we will not charge you extra fees when you choose to donate via PayPal. Yes, but we only accept donations in US dollars. These contributions are tax-deductible in the US. You need to consult your tax advisor in your country to determine if it is tax deductible there. Will Buddhanusorn shares my personal information? We accept online donations via PayPal. See options below if you wish to donate using other methods. Please Note: 100% of what you give via “Personal Check” or “Bank Online Bill Pay” go to Buddhanusorn temple. Make your gift go even further with your employer’s matching gift program. Please contact your Human Resources department to find out if your company participates in a matching gift program. If you have questions regarding matching a donation made to the Budhanusorn, please contact our Treasurer at (510) 468-2546 or email to donate@watbuddha.org. You can use the “Bill Pay” feature of your bank to send checks automatically to our temple, set it up to send check to our address above. Talk with your bank about setting this up if you need assistance.